Free Power Weekends 12 is rated 4.3 out of 5 by 69. Get over 100 days of free power with Free Power Weekends! With Direct Energy, you'll enjoy free weekends for 12 months! Get free electricity from 6:00 PM Friday-11:59 PM Sunday! Plus, you'll get a low, fixed rate the rest of the time. Direct Energy is a North America electric supplier that you can trust to power your home. We offer reliable service, secure account management and a great customer experience. Locking in your electricity rate in Texas provides security and protection against possible price spikes. The Online Account Manager is your all-access pass to your account. Access your bills, manage your rewards, transfer your service and much more. Pay your bill on time, every time! Sign up for Auto Pay and enjoy automatic bill payments each and every month. Late payments? Never again. Sign up for paperless billing and conveniently view all of your current and past bills online and on the go, from anywhere. The trees will thank you! 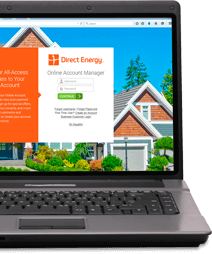 With Direct Your Energy, Texas customers get usage breakdowns by appliance, by day and more. There are no hidden costs, so you know how you can save more money — and energy! — in the future. When you participate in Reduce Your Use Rewards, you'll have the opportunity to get 10% off your bill when you lower your energy usage during peak times. Give us a call at 1-855-998-8365. 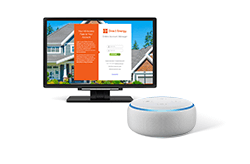 *Offer valid for new residential customers in Texas only. Provisioned smart meter required. Free power begins on Fridays at 6:00 PM and ends Sunday at 11:59 PM. Terms and Conditions apply. 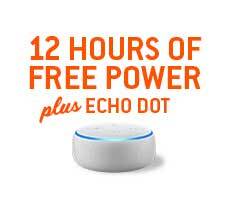 Rated 1 out of 5 by Rhonda from Plan isn't what i expected I brought this plan in JUNE 2018 cause of the promotion free weekends with an echo dot. Never received the echo dot. Im a truck driver who's never at home during the day and keep my thermostat at 74 since im not home. I called and complained about my estimates and was told their simply estimates and to go to some website for actual usage which i didnt have the info needed to look at the site. It boggles my mind that im not at home and the usage fluctuates each week when their is no change. I turned certain rooms off from the breaker and my estimated usage was still the same. If i could leave this company i would!! Rated 5 out of 5 by Lando91 from This is energy done right! We are relatively new Direct Energy customers, and I have to tell you that we absolutely could not be more pleased. This is by far the best utility company we've ever been with. I really mean that! We chose the Free Power Weekends 12 plan, which has been not only super convenient, but also efficient and affordable. Beyond affordable, actually. We no longer cringe when we receive our electric bill. The website has so many resources for account management, etc. And in our experience the customer service is helpful. They do genuinely care about customers. Rated 4 out of 5 by Ashley05are from Great plan I am really enjoying the free electricity on the weekend. I try to reserve laundry, dishes, and vacuuming for the weekends. I've had a good experience thus far! I do wish a free evenings option was available. As a nurse, I work a lot of weekends and the free electricity evenings would be more beneficial for my rotating work schedule. This is why I also looked into TXU, because they do offer free evenings but I found the kw/hr was a higher charge. Overall, I am very satisfied. Rated 5 out of 5 by LionessDani from Best Bang for Your Buck! This is my first time having to choose an energy provider. I asked around to see what everybody had and the name that kept coming up was Direct Energy. I did my research and decided to go with the few power weekends and it has been the best decision yet! I am usually home on the weekend and I figured that I could get big task done during those free hours. It has saved us so much money and I’m glad I chose this one over the free nights. The charge per kWh is reasonable and also still beats the competititors that don’t even have free periods. If anyone asks me who I have, I am happy to say DIRECT ENERGY! Rated 4 out of 5 by Deno from awesome so far I've had this plan for about a month & a half. although it seemed like the right choice when I picked it, I was still very nervous about receiving my first full month's bill. I had nothing to worry about. The free weekends saved me about $75 & my bill was only $117! one bedroom, September Texas heat & someone who can't sleep unless its 60 degrees in the house at night. This plan is awesome so far & I'd definitely recommend. Rated 5 out of 5 by steve37xx from Awesome free weekends! I've been with direct energy for over 14 years and love it! The only think is i have to remind to renew my plan every year to lock in savings! Looking forward to another 14 years! During the weekends on the free weekends plan - is there a max usage for it to be free? Do you guys charge an electricity connection fee per kilowatt? Do you guys have it set up where you pay for free weekends by paying more for using power during the week? Good Afternoon! Thank you for taking the time to reach out to us with your question. The price shown for the Free Weekend Plan 12 is an average rate based on a 2,000 kilowatt usage. The rate is the amount you would pay throughout the weekdays for service. For a further breakdown of the rate plan and fees included please click on the EFL link. Feel free to reach out to our Live Chat team that is available Monday-Friday 8:00 a.m.-5:00 p.m. for further assistance. Enjoy your day!